I have been in education now for over 25 years, initially I began my career as a shared music specialist. This entailed travelling to 5 schools during the week delivering a music program to the small schools, the furthest being 100km from Mildura with an enrolment of 8 in my final year there. From there I returned home and went to Lismore Primary School where I taught in the middle years for three years before starting my family. After a year Mortlake P-12 College asked if I would come and develop a choir with some interested Yr5/6 students. This was the beginning of a long association with this school. This initial job grew to 2 days a week teaching music, then 4 days a week when I became the leading teacher and the P-4 Leader. About 6 years ago I became fulltime and have been in leadership positions since then. In 2010 I completed a yearlong Bastow course entitled ‘Leaders in the making’. This sparked an interest in study and so in 2011 and 2012 I completed my Masters of Education (School Leadership) through Melbourne University. It was during this course that I learnt about Positive Education from an international leading expert, Assoc Professor Lea Waters. Although this was a relatively new field of psychology there was a lot of evidence regarding the positive outcomes it provides in the social and emotional development of students. So, in 2014 I went back to Melbourne University, whilst working full time, for 6 months and completed a Professional Certificate in Positive Education. In 2017 I started the year at Lismore Primary School as the Acting Principal and this was an amazing experience to be back after 20 years. Then in June I was offered the job as Principal of Port Fairy Consolidated School. I was so excited to be offered this job and feel grateful to be working in such a vibrant, creative and caring environment. 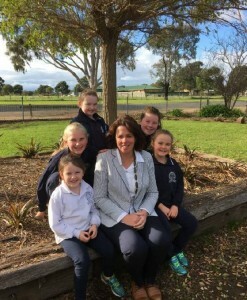 As the Principal, I am committed to leading the school community to work together to achieve excellence. I believe strongly in providing optimal learning environments that focus on learning growth for all and reflect the ever changing world around us. As the Instructional leader I encourage reflectiveness, feedback and lifelong learning so to develop a high performance culture. Positive Education is our foundational well-being approach with explicit teaching of character strengths each week. I am excited about the journey ahead at PFCS and am looking forward to what we can achieve together.